While doing research for my historical nonfiction, I spent a great deal of time going through old newspaper articles. Oftentimes, I found myself veering off the path, lured by the strange and fascinating tales depicted in these bygone newspapers. Some made me want to conduct another stream of research just to find out what happened to them, such as the woman who fainted in a department store, not from “lack of food,” as originally thought by police, but because her husband deserted her. Or what did the store clerk of Henry’s Dry Goods do after he walked away from his job and was never heard from again? For those writing historical fiction, old newspapers could provide those slivers of inspiration, but what about novels set in present day? We can still garner plot ideas and character sketches from modern newspapers, but we often find out what happens to them. 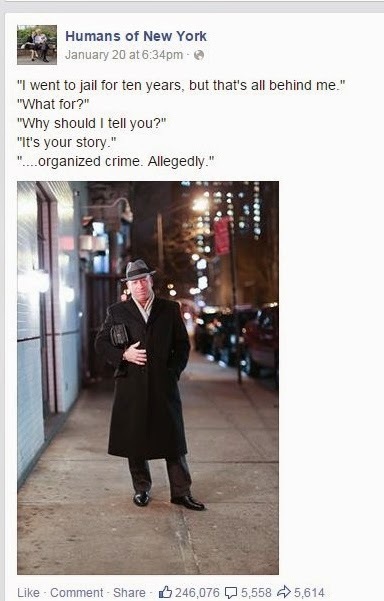 Brandon Stanton of Humans of New York, brings his Facebook readers a glance into the lives of random people he encounters on the streets of NYC. Accompanying the photo is usually a quote from the photo’s subject. This photographic peek is often the first and last glimpse we get of these individuals and I’m sometimes left wondering about their lives. Stanton’s bestselling book by the same title, is also great to have on your shelf for when you need some character inspiration. If you want your characters to feel like real people, why not start with real folks? Have you ever been inspired by true events or real people when writing ? I believe a small piece of us creeps into our writing, both fiction or nonfiction. If it didn't, we'd all write the same thing, the same way. Absolutely, I know I do that for sure. But sometimes I read about people and think: Now, they would make a great character in a book. The big crime (a check theft ring) in Dead Wrong is based on something that happened in a company I worked for back in the late 80s. I haven't based any characters on real life folks yet, but I have a couple of ideas swimming around. High school friends, watch out! You're so right, April. One of my favorite "stories" is the real adventures of Ernest Shakelton--one of those examples where the truth is already incredible. And I'd absolutely love to read a fiction based on the event--I mean, what was going on in those guys' heads when they were stranded in the Antarctic? On a completely different subject, where do you do your research with newspaper articles? Through the Poudre libraries or CSU? I'd love to begin doing more of that and don't know how to start. I've always been so fascinated with Shakleton's voyage as well, Kelly--I have a book about him sitting on my shelf waiting to be read. For my research, I used NewspaperArchive.com (they charge, but you can do a 1-week free trial) and also the Library of Congress's digital library that is free, but only goes up to 1922. Ancestry also has newspapers, and I think you can do a free trial with them as well. Some libraries have online newspapers, but many of them you can only access in person. I haven't checked out the Poudre libraries or CSU, but they'd be a great place to start. I could spend many hours engrossed in old newspapers and letters. Actually, they don't even have to be that old. I love coming across the small human interest stories like the fainting wife. And HONY is great, but I've never thought to use it for character inspiration. Thanks!